Interview candidates without being present, allowing all involved to view a video interview in their own time. Invite shortlisted applicants to complete an online personality test. Gain an insight into the personal character traits of any candidate. Create custom job-related questionnaires to gather more information from applicants at registration. 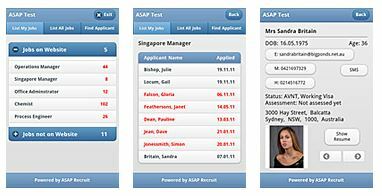 Receive applications automatically into your recruitment system from just about any Job Board globally. Setup as many people as you wish to access your system, for free! Only subscribe for simultaneous user access i.e. the number of users that you wish to access the system at any one time. Significantly more cost-effective and flexible than any other system. The system continually compares and analyses applicants as they apply for a job and rates their skills against each other all automatically, highlighting the best-suited candidates for the job. Search for candidate skills (keywords) through every word in every resume throughout the database in seconds to find the best candidate for a job. Access recruiting software data whilst on the go via the integrated “Mobile Phone App.” on an iPhone or any Android Phone. We can also help you to be up and running in minutes, advertising jobs and receiving applications, finding applicants for your jobs today!